Residential Address Plaque with Bird - - perched happily on a delicate tree branch. 15.5" x 9.5" oval address sign holds up to three lines of personalization. Wall mount. Made in USA. Unique shadow box double border accents the oval shape and enhances the sign's universal appeal. Line 1 with house number holds up to five (5) 3" numbers. Line 2 holds up to eleven (11) 1.25" characters. Line 3 also holds up to eleven (11) 1.25" characters. Character count includes punctuation and spelling. It is not necessary to use all three lines. If you are ordering a one- or two-line sign, please leave any extra input boxes empty. Colors: AC antique copper, BG black/gold, BS black/silver, BV bronze/verdigris, OB oil rubbed bronze, OG bronze/gold, PS pewter/silver. Large image shown in black silver. Smaller images (from left to right): antique copper, black/gold, black/silver, bronze/verdigris, oil rubbed bronze, and bronze/gold, and pewter/silver. Dimensions: 15.5"W x 7.5"H x 0.375. Alumi-Shield™ coating will protect your address plaque against the harshest weather and environmental elements. 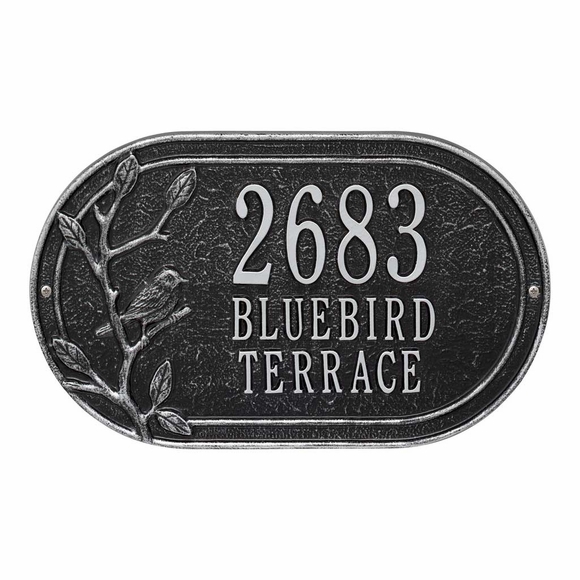 Bird theme metal address plaque with house number and street name.